You can easily improve your thoughts and feelings with a rampage of appreciation. If you've heard of Abraham-Hicks, you might already be familiar with a rampage of appreciation. They've been teaching it for years. 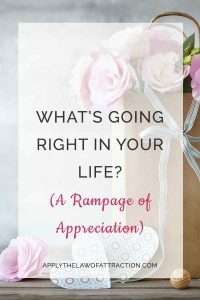 A rampage of appreciation is about focusing on what is going right in your life. Look around you and see something you like. Appreciate it. Keep finding things to appreciate and watch as your positive feelings improve. Each time you find something to appreciate, you tell the Universe to bring you more of it. So if you appreciate hearing your child's laughter, you're telling the Universe to bring you more instances of your child laughing. The more often you do a rampage of appreciation, the more wonderful things you will find to appreciate. This simple exercise allows your life to keep getting better and better. 1. I love that I'm in Ottawa, having a wonderful time with my husband. It's so nice to be home! 2. I love that I missed the heat wave! The weather is so nice and cool, with a gentle breeze rustling the tree leaves outside my window. 3. I love that I just received a surprise package in the mail. I can't wait to open it once I'm done writing this! 4. I love how free my days are, allowing me to come and go as I please. 5. I love how my husband and I always whip up fantastic meals on the spur of the moment. We truly enjoy cooking together and always amaze ourselves, and our friends and family, at how utterly delicious the meals are. I love that when we want to eat out, we're able to find restaurants where the food tastes as good as what we make at home. 6. I love that the weather cleared just in time for my flight to reach Ottawa Friday. I am so glad I knew how to use the Law of Attraction to turn a situation that everyone else thought was impossible into exactly what I wanted to happen. 7. I love my chocolate mousse. I made some last night and it tastes just as good today, maybe even better. I am so glad I came up with such a good recipe! 8. I love the new farmer's market I found yesterday. So much fresh and tasty produce at my fingertips. 9. I love how great my relationship is with my mother. I love that we have a true and lasting, supportive friendship. 10. I love all the wonderful people checking out my site and reading my articles. I appreciate all the kind words and emails of appreciation they send me. It's good to make a habit of finding 10 things you can appreciate. Something so simple really can produce wonderful results in your life. I know you all have at least 10 things going right in your lives. I'd love to hear your rampage of appreciation. You can email it to me or paste it in the comments here. I really do like it when you leave comments. It's just as inspiring for me as the emails you send…and the comments are also a great way to inspire everyone else who reads this site. Are You Struggling to Use Feelings with The Secret? Great post , but could you clarify the difference between Gratitude and Appreciation as I find this confusing ? Hi B – Appreciation is a higher vibration than gratitude. It’s possible to have gratitude without appreciation, but appreciation and gratitude occur together. For example, you can be grateful for a roof over your head or food on your plate, but that doesn’t mean you appreciate those things. When you add in appreciation, you notice the positive qualities, such as how well the roof was built or how good the food tastes. Gratitude can incorporate struggles we have overcome, such as a time when you weren’t always sure about whether you’d be able to afford housing or food. You can be grateful that your current situation is now different, but you’re still including some of the vibrational frequencies of past struggles. Appreciation is similar to love in terms of vibrational frequency. There is neither fear, doubt, nor resistance. It is a vibrational energy that helps you to align with your desires and your best self. Elizabeth – thanks for taking the time to give a thorough explanation. Hi Elizabeth. Is it normal to do so much gratitude thru out the day that it ends up being positivity on auto pilot, as opposed to most ppl are running on autopilot on the negative? Hi Tiffany – Gratitude can become a normal state of being. You can experience it as your normal mode, just as some people run on the negative. 1. I love how I always attract new people in my life that are in need of hearing about the LOA! It feels amazing to know I’ve helped to spread the wealth! 2. I love living on my own! It feels so wonderful to be able to use the bathroom when I want, take a nap when I want, and to watch any channel I want without having to wait for or consider others in the household! 3. I lovvveee my new coworker! We have so many of the same interests that being around her during my work day truly elevates my mood to a positive and fun level! 4. I love how close I am with my mom! She is ALWAYS there for me and it’s such a privelage and blessing to have such a warm and loving connection with the woman that has raised me and guided me. She is my BEST friend! 5. I love love love that my best friend since 1st grade (I’m 29 now), one that NEVER wanted to hear about the LOA and felt it was a load of crap is now using it to get a new awesome job!!! She’s seen all I’ve manifested and now believes!! So I’m stoked she will most definitely get the career she is wanting!! Yayyyy! 6. I love truly believing and feeling that there is enough for everyone! It fills me with warm comfort and knowingness that helps me to see past competition or eliminates worry of not achieving all that I want because there is plenty to go around! Knowing this has truly changed my life for the best. 7. I love how close I am with my family! My cousins, aunts, uncles, my brother, and both of my parents all come together on a regular basis to spend time together. We don’t even have to do anything in particular, just sitting around and spending time together fills me with pure love and joy. 8. I love that I am able to love myself without anyone elses approval or companionship! That was not always the case and being able to enjoy time alone is extraoridnary to me! I am able to laugh on my own, smile on my own, and feel love and joy within myself. Having awesome people around to spend time with when I am wanting is just a bonus! 9. I love being able to write this out for many to see! Being able to feel appreciation, gratitute, positivity, love and all else good on a daily basis has made every single day of my life enjoyable and sharing that with others lifts those good feelings to an even higher level! It makes me feel like my own sunshine follows me where ever I go! 10. I love this website! I can go here for daily inspiration and can always find information that is directly relating to and addresses my experiences or questions I may have about how to apply the LOA for a particular topic. Thanks for letting me share Elizabeth! I hope you and your family continue to enjoy your new home! What a wonderful rampage Monica! 1. I appreciate the uniqueness and individuality of a lot of the decorations in my home that I have collected over the years. 2. I appreciate my husbands laughter and good sense of humour day in and day out. He can always make me smile. 3. I appreciate that my daughter is such a wonderful student and cares so much about her grades that she has a 4.0 GPA. 4. I appreciate that my family spends time laughing together and enjoying each others company. 5. I appreciate the abundance of delicious foods and drinks that are always available for my families enjoyment. 6. I appreciate the sound of music coming from my daughters room as she plays the piano, completely self taught no less! 7. I appreciate the muscles in my body that allow me to do every little thing that I do day in and day out. I love the feeling of using them and feeling them working. 8. I appreciate the way money just flows into my life whenever I need it like a tap. 9. I appreciate my beautiful pets whose love and affection brighten my day every day. 10. I appreciate being a unique individual with so many passions and talents and desires.